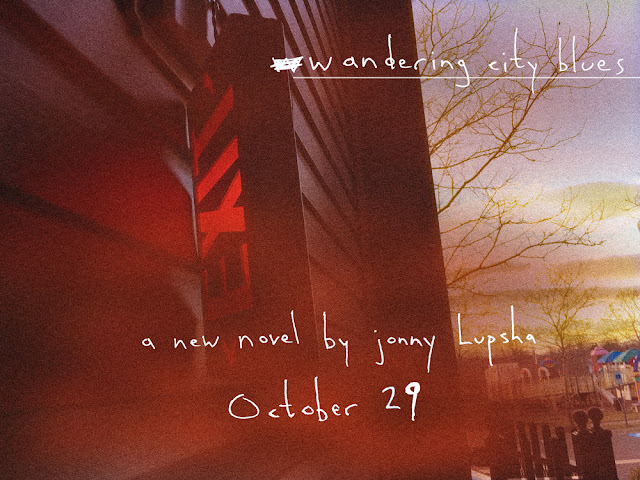 Wandering City Blues: Live Video / New Ad! Happy...Tuesday?! Whoa, wait, whaaaaaat?! This week's blog is coming at you a day early to prep for a live event I'm doing tomorrow. Here's the information. At 10am Eastern time on Wednesday, October 5th, I'll be broadcasting live from my living room to talk about Wandering City Blues for a while. I'll be taking questions, showing off some of the prizes I'm giving away at my launch events later this month, spinning a couple songs that inspired the book, doing a brief reading, unloading never-before-heard details about the project and more! Tune in at facebook.com/ACarrierofFire - or don't. That won't stop me. I got nothing else to do tomorrow; I'll entertain my damn self on video all morning. Ha! With the full-on launch of the book only about three weeks away, I'm doing my best to ramp up promotional stuff. Consider this a reminder to come to my local pre-launch at Comic Logic in Ashburn, VA on October 26th. I'll be there around 3 p.m., so you can be the first to buy a copy of Wandering City Blues and get it signed, check out the awesome shop itself, hang out with me and talk or get an early start on the party at The Ashburn Pub in the same shopping center, which starts at 7 p.m. and goes until whenever we all get tired and go home. The party at The Pub will have live DJ'ing, a cocktail menu inspired by the book and invented by Pub owner Kevin Bednarz, more copies of the book, me, both my friends and my parents! Both events will have free giveaways too, including but not limited to a rare test copy of the book, a signed poster, a CD of the fictional podcast / radio drama that's set in the Fogworld universe and some of my original handwritten notes/promo material for the book. Immediately following the event on the 26th, the worldwide launch of WCB is officially slated for October 29th. So look forward to another major event on October 29th at VA Comicon at the Richmond International Raceway in Richmond, VA. I'll have a table at the con all weekend, where I'll have plenty of copies of WCB in stock, but on Saturday the 29th, the con will host me on a panel about the book where there will be nearly identical giveaways to the Ashburn event. Check back here for details on the time and room number or visit VAComicon.com for more info as the date approaches. Finally, here's this sweet new ad that we're putting up on Facebook and Twitter today. Enjoy!